RAHI, the Rural Alaska Honors Institute, at the University of Alaska Fairbanks is a six-week, summer, college preparatory bridge program for Alaska Native and rural high school juniors and seniors with a cumulative GPA of 3.0 (or close), who are interested in attending college. RAHI is a statewide competitive program; if you are chosen, all expenses are paid including travel to the program. Dates for the program are: June 1 – July 15, 2010. Application deadline is: March 31, 2010. For more information and application, see http://www.uaf.edu/rahi/. See attached job description for temporary job openings – perfect for students, retirees or others with flexible schedules. The Anchorage Museum at Rasmuson Center has an immediate need for Temporary (90 days beginning January 25, 2010), Part-Time Visitor Services Assistants. Attached are the available positions at Association of Village Council Presidents. The application is attached for your convenience. For more information, contact Lema Pete, HR Coordinator, AVCP, P.O. Box 219, Bethel, AK, 99559, 907-543-7307, Direct 907-543-7329, or via email wpete@avcp.org. 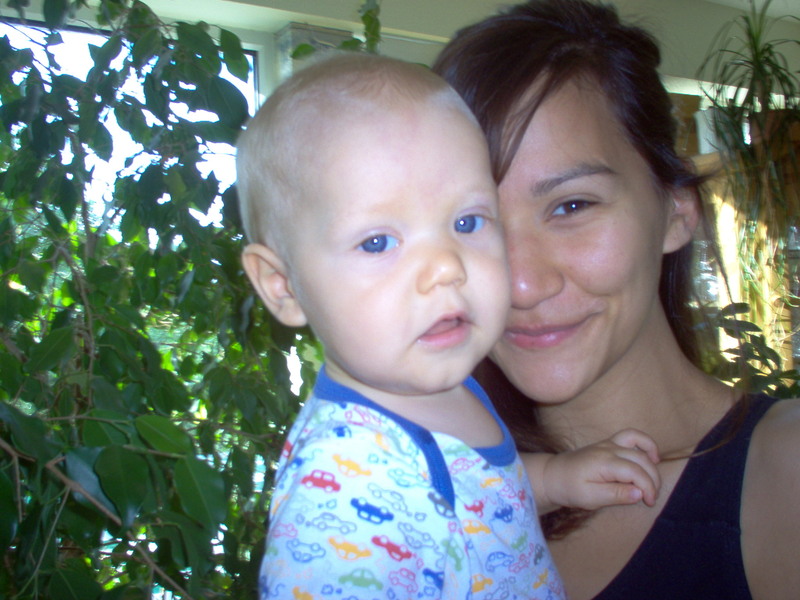 Doyon Foundation student Amy Gustafson and her 3-year-old son, Noah. Doyon Foundation student Amy Gustafson is certainly a long way from her hometown of Fairbanks, Alaska. Gustafson is currently attending Otto-von-Guericke University in Magdeburg, Germany, where she is pursuing a bachelor’s degree in European studies. She expects to graduate next month and plans to do an internship before beginning a master’s program in European studies in October 2010. “After I attain my master’s degree, I hope to go on to work with an embassy or government organization. As I speak four languages and am open to learning another, the location of my future employment is unimportant. I am open to the United States or Germany,” Gustafson said. As a single mother away from her family and studying in a foreign country, Gustafson has faced her share of challenges while pursuing her education. “I have had to overcome many stereotypes about single mothers in college – people thinking I would not complete my studies or that I don’t take university seriously,” Gustafson said. With her upcoming graduation, several internship opportunities on the horizon, and plans to attain a master’s degree, Gustafson has proven those stereotypes wrong. She credits this success to hard work and determination. “I think that being determined is two-thirds of the work; just keeping your goals clear helps you recognize all and any problems that arise,” she said. In addition to her busy academic life, Gustafson is also a dedicated mother to her 3-year-old son, Noah; tutors other students in English; does English-German translations; and attends church. She also stays in touch with her family on the other side of the world. “I love and miss my big family in America,” said Gustafson, who is the daughter of Jon A. Gustafson and Mary Long, the step-daughter of Vern Long, and the granddaughter of Gus Gustafson, and Cliff and Joyce Burglin. This is a friendly transcript reminder for all returning fall and winter Doyon Foundation students. Please remember to order your FINAL fall or winter 2009 grades to be sent to Doyon Foundation if you plan to receive spring 2010 funding. For more information contact Doyon Foundation at bringhurstg@doyon.com or 907-459-2048. Thank you and Merry Christmas! The Association of American Indian Physicians will select AI/AN high school students, ages 16 – 18, to attend the National Native American Youth Initiative (NNAYI) program to be held June 19 – 27, 2010 in Washington, D.C. AI/AN students planning to enter health careers are eligible to apply. Students are selected on the basis of scholastic achievement, demonstrated interest in the fields of health sciences or biomedical research, leadership skills, and personal attributes. The NNAYI scholarship pays for airfare, lodging, and most meals. The deadline is April 16, 2010. For more information contact Lucinda Myers, M.S.W., NNAYI Program Director at (405) 946-7072, or via e-mail atlmyers. For more information or to RSVP, please contact the Foundation at 907.459.2048 or foundation.